Thousands of people evacuated from a flood in San Jose are returning amid warnings to be careful about hygiene and handling food that may have come into contact with flood water. Bob Redell reports. 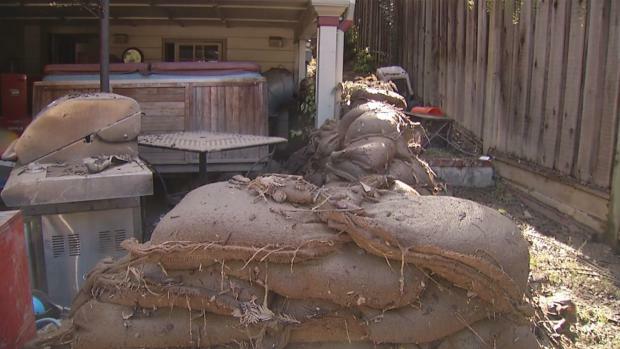 Gloria Najar said it felt like an "apocalypse'' when she returned home after being evacuated in a flood that sent waist-high water into homes and streets in San Jose. Still, as she sorted through her water-logged possessions Thursday, she said she counts herself among the lucky. The 57-year-old — one of thousands of people ordered to evacuate Tuesday — lost almost everything in her garage, but her second-floor condominium was dry. "It felt like an apocalypse. It was unreal," said Najar, who found that her $10,000 leather couch, another pricey velvet couch, kitchen items and "other things I've had forever" were ruined in the garage. All that was left was her bicycle, her daughter's childhood tricycle and some family photographs that her now 37-year-old daughter, Katrina Santos, was spreading out to dry. "I'm telling myself these things don't matter, as long as our home is OK," Najar said. As she disposed of the damaged items, Najar said she was thinking of nearby homes that were flooded "all the way to the roof." About two-thirds of the 14,000 evacuated residents were being allowed to return home after Coyote Creek overflowed its banks then began to recede. Some mandatory evacuation orders, including the area around Senter Road and Phelan Avenue as well as mobile home parks near Oakland Road, remained in effect as of Friday morning, but those impacted regions are shrinking as the water is diverted. In one of San Jose's hardest-hit neighborhoods, Khanh Nguyen lost everything. He spent Thursday hosing down and mopping up his ground floor apartment after removing his furniture, appliances and clothing, all destroyed by the flood. "I'm worried. I don't have a place to live in," said Nguyen, who for now is staying with relatives. Thousands of people evacuated from a flood in San Jose, California, returned home Thursday amid warnings to be careful about hygiene and handling food that may have come into contact with flood water. Chuck Coppola and Ian Cull report. People who went home were warned to be careful about hygiene and handling food that may have come into contact with flood water. "The water is not safe," Mayor Sam Liccardo said. "There is contamination in this water and the contamination runs the gamut." Liccardo acknowledged Wednesday that the city failed to properly notify residents to evacuate and had to resort to going door-to-door in the middle of the night to order many people to leave. Some people said they got their first notice by seeing firefighters in boats in the neighborhood. "We are assessing what happened in that failure," the mayor said. The city began alerting residents about flooding on Tuesday via social and mainstream media and sending emergency alerts to those who had signed up for it, city spokesman David Vossbrink said. Officials sent firefighters late Tuesday to evacuate about 400 people from a low-lying residential area. City officials said they did not believe the waters would spread to other neighborhoods and did not expand the evacuation orders. Flood warnings were in place until Saturday because waterways were overtaxed. Councilman Tam Nguyen asked landlords to provide three months of free rent to victims of the floods in his working-class Latino and Asian district where 350 homes were flooded. AP writers Kristin J. Bender and Terence Chea contributed to this report from San Francisco.